Test trains coming, RTD turned 50 and we have photos to share, see the results of our RTD Fare quiz, and more — read on! Test trains are coming! | TransForum is April 26; watch for event registration details on March 18 | Smart Commute attended RTD's 50th Anniversary celebration, and we can share some photos | See the results from last month's RTD quiz, and see if you can beat the average score | We have photos from Congressman Perlmutter's Senior Resource Fair | and news to peruse — read on! RRP will electrify the Overhead Catenary System (OCS) - the wires that provide trains with electricity - this week. RRP is scheduled to start running test trains in mid-April. RRP will operate test trains from 7 a.m. - 7 p.m., and while test trains are running, crossing attendants will be at all crossings where the train crosses the road ("at-grade" crossings) - Steele Street, Thornton Parkway, 100th, 112th, and 124th. The trains will use their loud horns - this is required for the safety of people walking and driving. 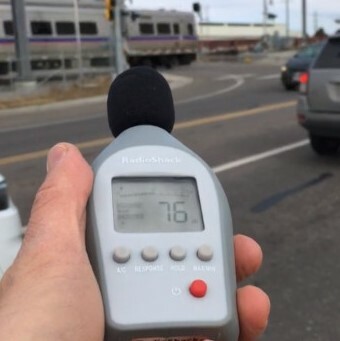 Trains will sound horns until the FRA (Federal Railroad Administration) approves quiet zones - something not to expect for many, many months. If you see anything that appears to be a concern to the project, call the Construction Information Line, 720-456-5279. 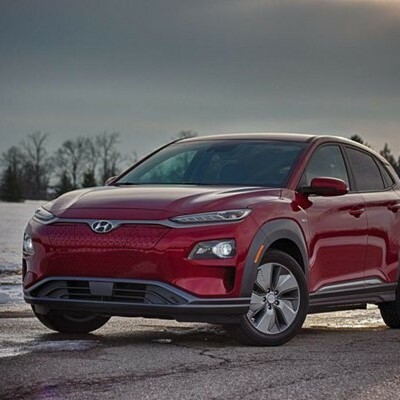 Do not try to touch or throw objects at the overhead power lines or climb on the power poles – the wires are up, and live with 25,000 volts of electricity! Stay alert and look both ways for a train – you may not hear them coming. For additional information or to provide comments/feedback, visit the N Line Project website or email Lisa.Trujillo@RTD-Denver.com or Kberumen@RRPJV.com. Save the Date! 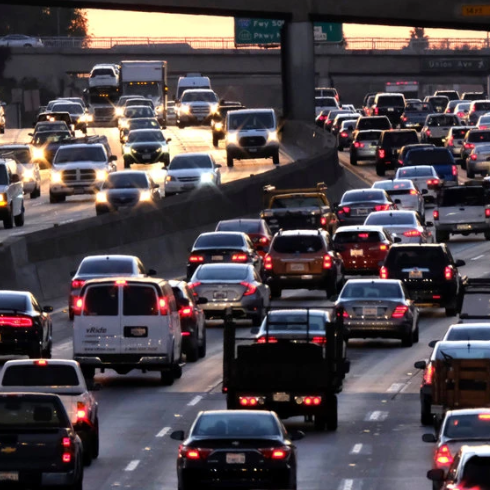 Smart Commute will host our 7th TransForum on Friday, April 26. Watch for more information by email on March 18. 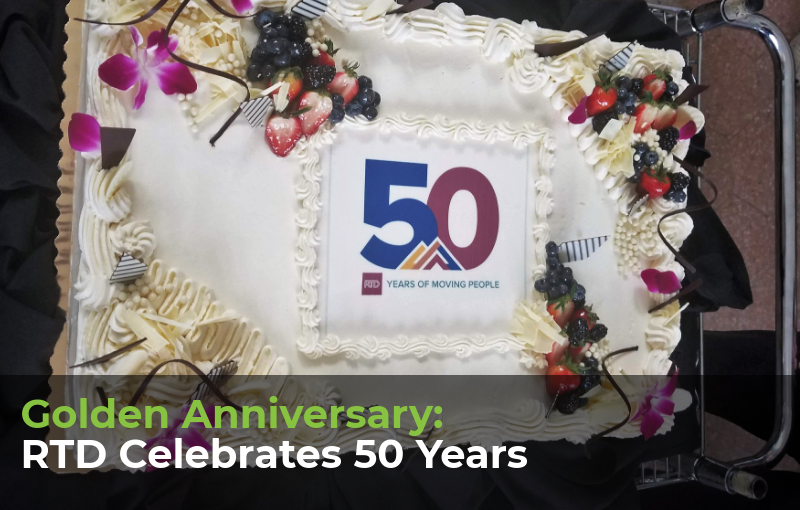 On March 8, RTD honored its golden anniversary with an event that recognized the transit agency’s half-century of history. RTD also unveiled a special 50th Anniversary Logo in recognition of this occasion. RTD Chair Doug Tisdale opened the events with remarks on RTD and shared some fun facts, including that the RTD district is the same size as the State of Delaware and that RTD's board has been an elected body since the 80s. Dave Genova recognized RTD's achievements and praised two employees who have worked at RTD for the last 50 years. RTD then unveiled their special logo, raised glasses of sparkling cider, and toasted their achievement. See photos on Facebook. RTD has a full run-down of its history as an agency online, and Streetsblog has another, grouped by theme. Last month, Smart Commute released our RTD Fare Quiz, and results are in! 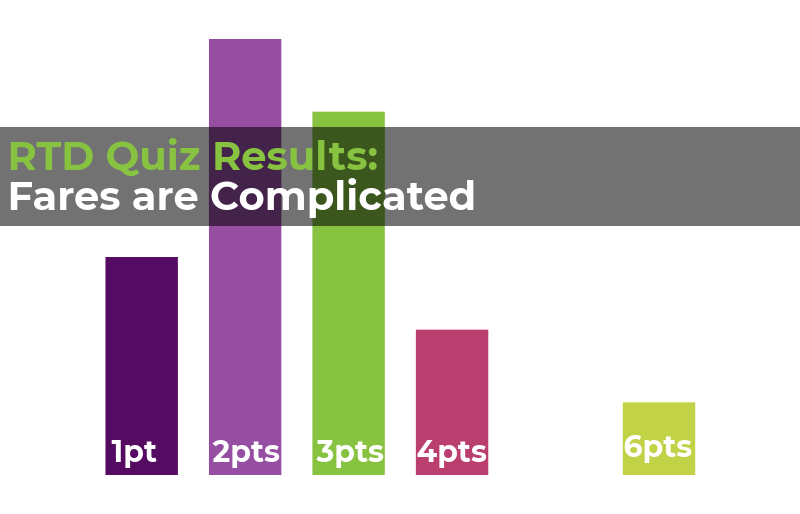 On average, quiz takers got a little over two questions correct out of five. 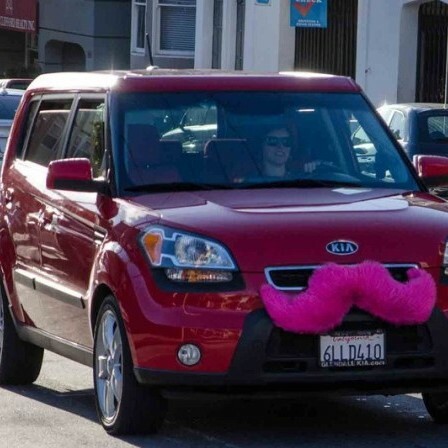 Questions were designed to be tricky, which reflects the RTD Fare System to novice users. All the questions can be answered by reviewing our "How to Ride the Bus" page, a viewer-friendly infographic that helps new riders take successful steps toward riding transit. Smart Commute wants to recognize that newly elected RTD Director for District J, Vince Buzek, earned a rare 100%. This is a strong sign that this district is well-represented! Want to test your smarts? The quiz is still open for new responders. 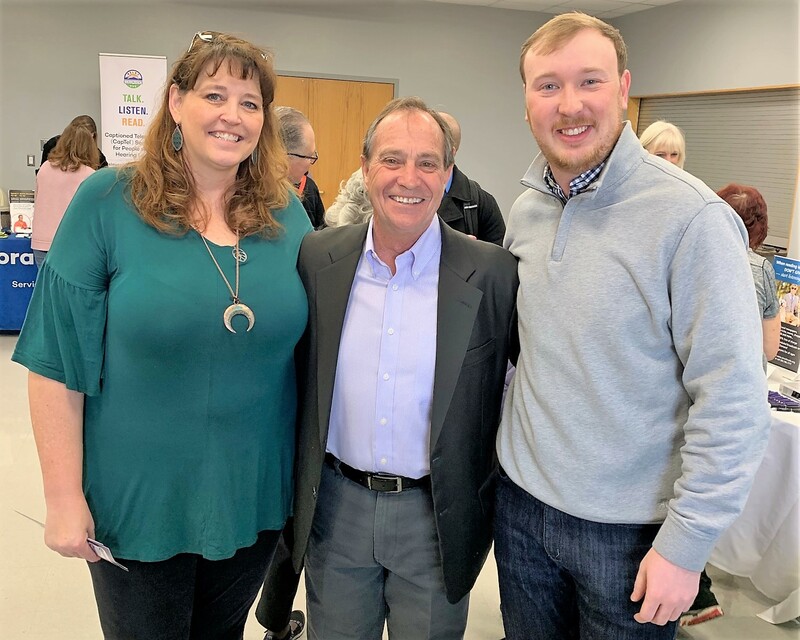 Smart Commute was proud to attend Congressman Perlmutter's Senior Resource Fair. We answered many questions about the upcoming N-Line Commuter Rail, hopefully running in our area in 2020. 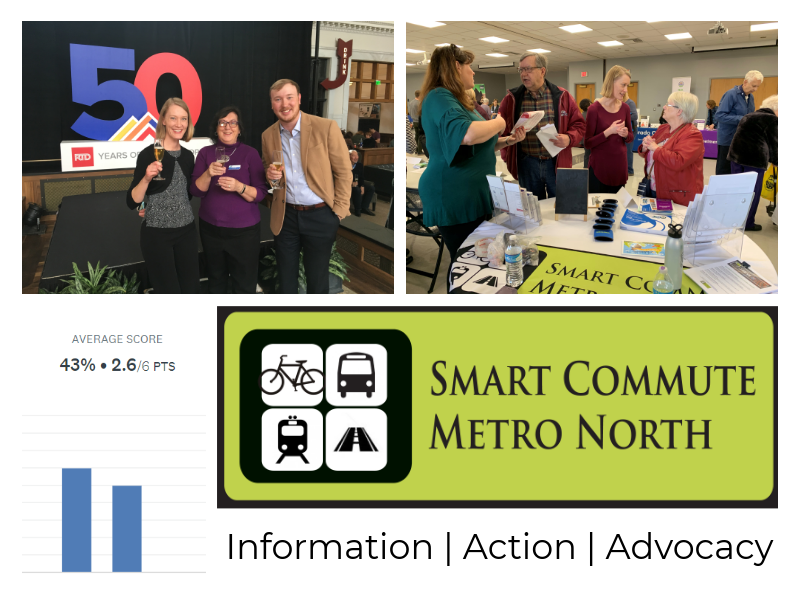 Smart Commute is the Way to Go provider for the north metro area. Learn about this regional program at waytogo.org. Copyright © 2019 Smart Commute Metro North, All rights reserved.